On January 21, 2015 fishermen in Australia were startled by a rare and endangered frilled shark! There has only been one caught before. It was caught in Japan in 2007. The frilled shark has 300 teeth in 25 rows, and it has 6 pairs of gills which is why it is called a frilled shark. It’s about 5 feet long. Its roots have been traced back 80 million years. 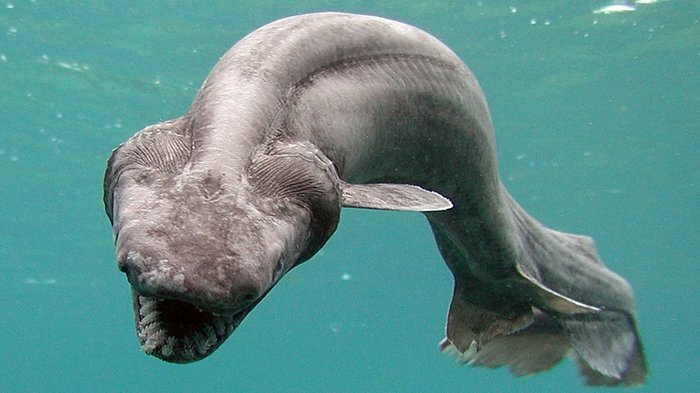 “In the most recent of those 80 million years, the frilled shark has been scaring the bejeezus out of humans who pull it out of the water to find an animal with rows of needle-like teeth in a gaping mouth at the front of its head.” But the frilled shark is not a freak of nature, but an endangered species. See more about this cool shark at the link below. This entry was tagged ocean, sharks. Bookmark the permalink. This is something that is worrying me a great deal. Already this year there have been catches of a rare megamouth shark in the Philippines as well as a Goblin shark in Australia. This fish are not seen for years and suddenly one is appearing every week. Surely it must be down to over-fishing or even more devastating methods of fishing the deep oceans of the world. Wow! I didn’t know this type of shark even existed!